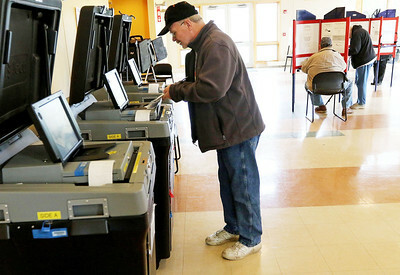 Candace H. Johnson-For Shaw Media Jon Dudley, of Lindenhurst votes during Early Voting at the Antioch Township Hall in Lake Villa. 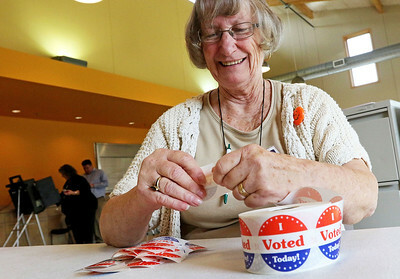 Candace H. Johnson-For Shaw Media Christie Andell, of Lake Villa votes during Early Voting at the Antioch Township Hall in Lake Villa. Candace H. Johnson-For Shaw Media Election Judge Kathryn Hausman, of Antioch gets the "I Voted Today!" 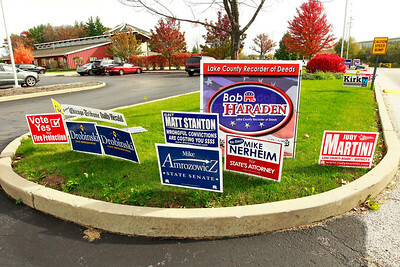 stickers ready to give out during Early Voting at the Antioch Township Hall in Lake Villa. 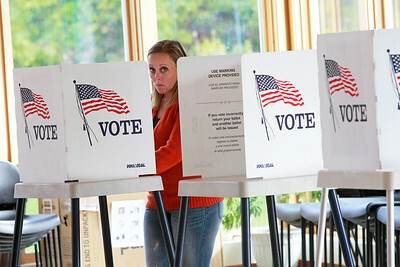 Candace H. Johnson-For Shaw Media People arrive at the Early Voting Center to vote at the Antioch Township Hall in Lake Villa. 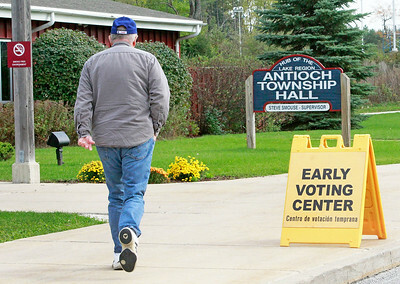 Candace H. Johnson-For Shaw Media A man walks into the Early Voting Center to vote at the Antioch Township Hall in Lake Villa. Candace H. Johnson-For Shaw Media People wait on line to vote during Early Voting at the Antioch Township Hall in Lake Villa. 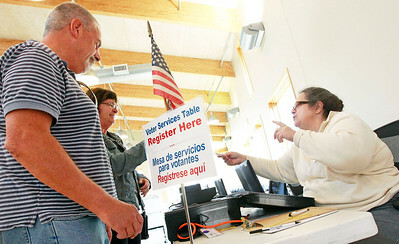 Candace H. Johnson-For Shaw Media Yvonne Meltzer, of Antioch hands her husband, Paul, his "I Voted Today!" 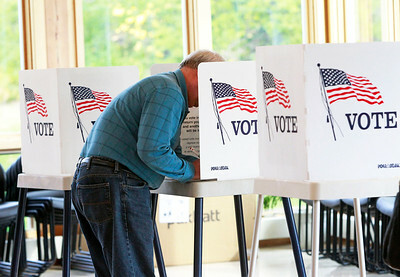 sticker after they voted during Early Voting at the Antioch Township Hall in Lake Villa. 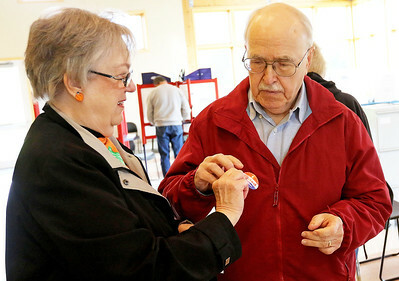 Candace H. Johnson-For Shaw Media David Chesonis, of Antioch casts his ballot during Early Voting at the Antioch Township Hall in Lake Villa. Candace H. Johnson-For Shaw Media Ron and Stacey Bing, of Lake Villa register to vote with Charisse Bruno, of Buffalo Grove, election judge, during Early Voting at the Antioch Township Hall in Lake Villa. 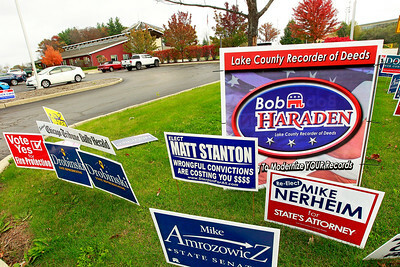 Candace H. Johnson-For Shaw Media Signs line the driveway during Early Voting at the Antioch Township Hall in Lake Villa. 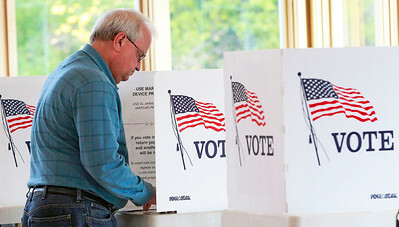 Jon Dudley, of Lindenhurst votes during Early Voting at the Antioch Township Hall in Lake Villa.